Executed in February 1875 on a carte de visite, this watercolour is one of the earliest and most intimate portraits of Gauguin's first son Emil. 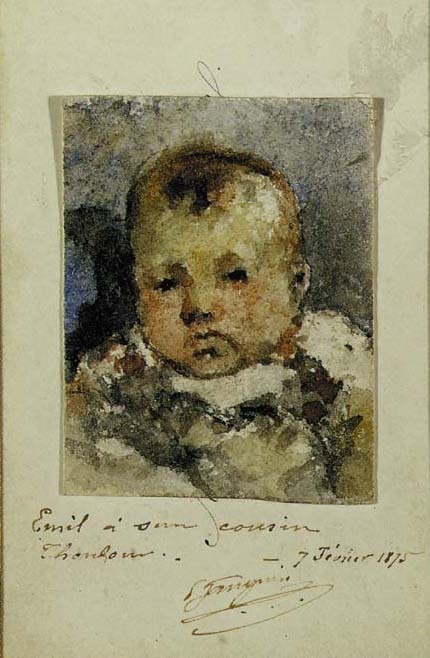 Born in Paris on 31st August 1874, Emil was a baby of six months when Gauguin, at the time still working as a broker on the Parisian stock exchange, traced this most delicate bozzetto, dedicated to the boy's cousin - the son of Mette Gauguin's sister, Ingeborg Gad, and the painter Fritz Thaulow, who had married in October 1874. Fritz Thaulow was also Emil's godfather, when he was baptised at the Evangelical Lutheran Church of the Redemption, on 8 may 1875. The Wildenstein Institute has confirmed the authenticity of the present work with a certificate dated Paris, le 15 mai 2000, confirming that it will be included in their forthcoming catalogue raisonné de l'oeuvre de Paul Gauguin. Please note that the provenance for the present lot should read: Anon. sale, Christie's London, 19 March 1991, lot 13 (where purchased by the present owner).